On a blustery and cold January night thousands of people filed into the McCormick Center in Chicago to hear President Barack Obama’s farewell speech. He started and ended his presidency in his adopted city and touched on the beginnings of his career as a community organizer on Chicago’s South Side. As Donald Trump prepares to be innaugurated Obama’s legacy is less secure than if he had handed the highest office to a Democrat but there is no doubt that Obama will be missed and remembered by a large portion of the American populace. By late Tuesday afternoon, inside a cavernous hall at Chicago’s McCormick Place convention center, the thousands of people snaking around barricades and along walls had grown restive. Eventually, there was a flutter of bodies toward the front of the line, and a chant began to build. Yes we can! Yes we can! Yes we can! the multitudes called out and swayed until their chants became roars. Finally, the gatekeepers signaled, and people of all stripes, the American tableau, began to rush toward the security checkpoints. A new chant rose as they ran: O-BA-MA! O-BA-MA! O-BA-MA! Three friends, who had lined up for tickets at 4:30 a.m. Saturday for tickets and returned to McCormick Place on Tuesday morning at 6:30 so they could be first in line, double-timed it toward the exhibition hall. It was “not enough to be in the building,” said Brianna Woolridge, 28. Their president had come home to say goodbye and they needed to be as close as possible to the stage. Just behind the trio, Cynthia Whitemon moved as fast as she could while pushing her red walker. She was from the South Side — “Obamaland,” she called it — and she’d been at the president’s 2008 acceptance speech in Grant Park, she’d been at his first inauguration, and now she had to be here as Obama said farewell to her, to the nation, perhaps to the city of Chicago, she feared, panting and pushing her walker. 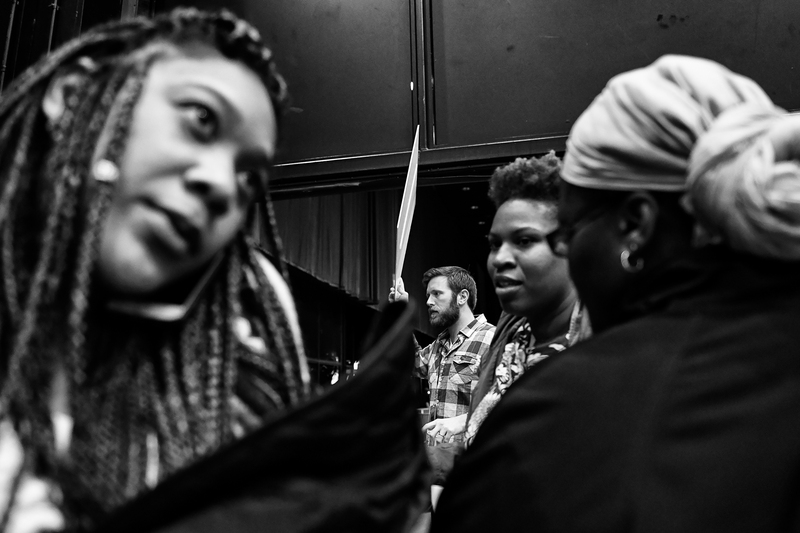 Guests look for friends before going into their seats for President Barack Obama’s farewell address January 10, 2017 at the McCormick Place in Chicago, Illinois. Behind her, as far as the eye could see, the crowd surged toward the hall. Barack Obama had been the change they believed in. Now, with the election of Donald Trump, thousands of hurt-up believers hoped he would preach a word and drop a balm. They needed his final speech as president to have inspiration enough to calm their fears and hope enough to sustain them in the days to come. On Saturday, she and her daughter Grace, 9, rose before dawn to wait hours for tickets to the speech. There’s only one degree of Obama separation on the South Side, and she knew people who could hook her up, but “with Grace, I wanted her to see and feel the importance of waiting in line,” Brown said. Grace doesn’t call Obama the first black president. She calls George Washington and John F. Kennedy the white ones. 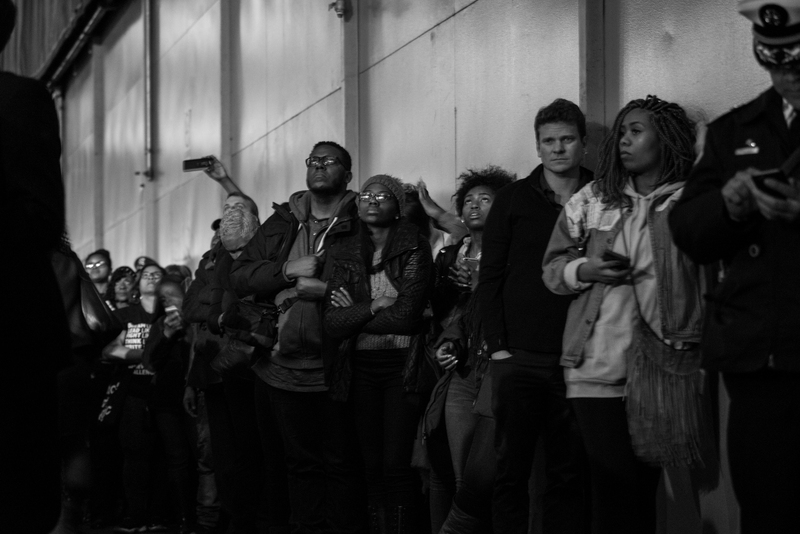 Inside McCormick Place, the lights were dimmed, and some began to cry when Obama took the stage. They stomped and applauded when he opened with “My fellow Americans … ,” and they chanted Four more years! when he talked about coming to Chicago and finding his purpose in life. “It was on these streets where I witnessed the power of faith, and the quiet dignity of working people in the face of struggle and loss,” Obama told the crowd. 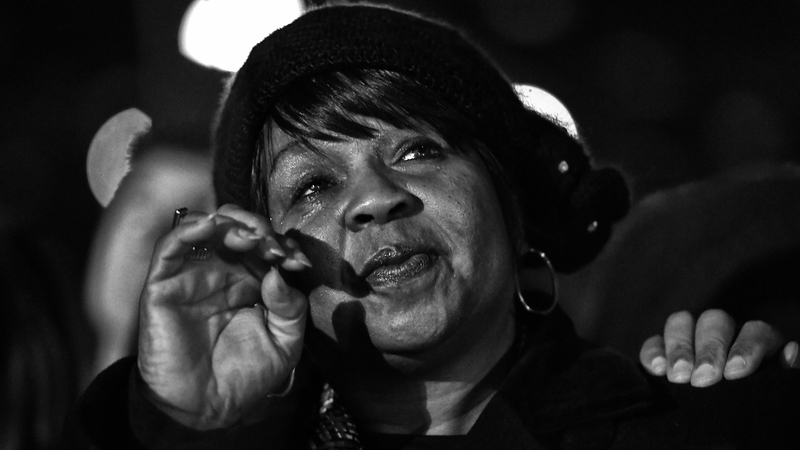 Cathy Nored, from Dallas, Georgia, wipes away a tear before the start of President Barack Obama’s farewell address January 10, 2017 at the McCormick Place in Chicago, Illinois. Eugene Robinson Jr., a college and career specialist for Chicago Public Schools, wasn’t able to get tickets to the farewell, but said he’d be tearing up as he watched from home. Obama’s presidency was critical for African-American males “to see what hope looks like,” he said. It gave him an example to pass on to students, and to hold on to for himself. “I believe in diversity. I believe in opportunity. I believe in all those things he believes in,” Robinson said. Though part of him wants to avoid watching the news or reading about the next president, that doesn’t honor the last eight years. “If I check out, they win,” he said. Robinson’s belief extends to the first lady, whom Robinson says gives him goosebumps. “Michelle Obama as first lady was amazing” for black people and for the nation, he said. She reminded him of the most important women in his life, his mother and his grandmother, who celebrated family and preached the gospel of education. A tear appeared in the corner of his eye. In the crowd, some of the tears spilled onto faces. President Barack Obama takes a moment to reflect during his farewell address January 10, 2017 at the McCormick Place in Chicago, Illinois. 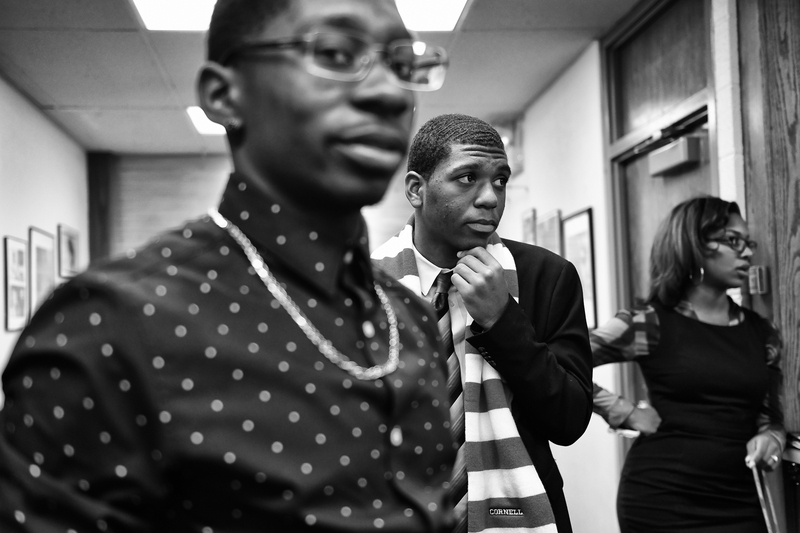 Tuesday morning, students gathered inside the library at Kenwood Academy High School, four blocks from the Obamas’ home, to talk about what Obama meant to them, and to recount his most memorable moments. There was the time he sang Al Green’s Let’s Stay Together at the Apollo Theater in Harlem, New York, or that time he was in a locker room formally shaking a white guy’s hand, then code-switching to dap up Kevin Durant in a brother-man hug. He was the only president some of them clearly remembered, he’d normalized black excellence and White House cool, and while they were nervous about a Trump presidency, “growing up with Barack Obama gave me the inspiration and the motivation I need,” said Brandon Brown, a 17-year-old senior. 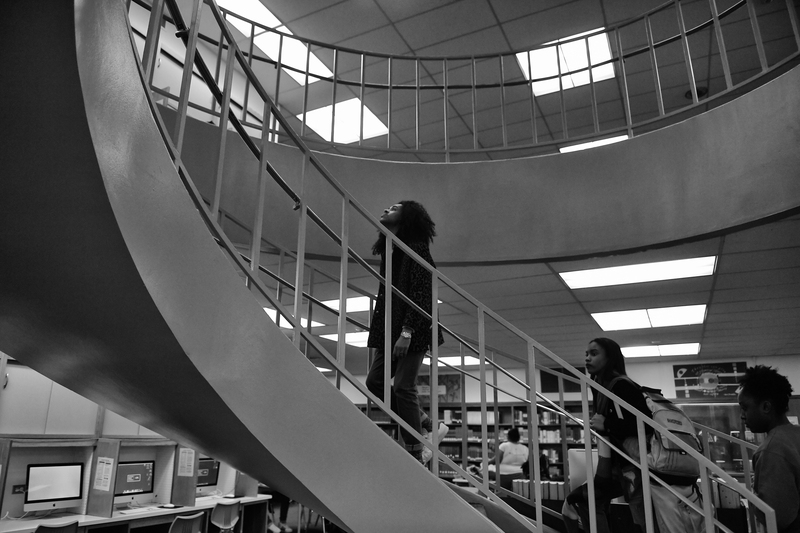 Sejahari Saulter-Villegas, 17, leads his fellow students up the stairs in the library on January 10, 2017 at Kenwood High School in Chicago, Illinois. inside of the principal’s office on January 10, 2017 at Kenwood High School in Chicago, Illinois. At the podium Tuesday night, the president urged Americans to hold on to the only change they could ever really believe in. “My fellow Americans, it has been the honor of my life to serve you. I won’t stop. In fact, I’ll be right there with you as a citizen for all my remaining days. But for now, whether you are young or whether you’re young at heart, I do have one final ask of you as your president. The same thing I asked when you took a chance on me eight years ago. I am asking you to believe, not in my ability to bring about change, but in yours. “I am asking you to hold fast to that faith written into our founding documents, that idea whispered by slaves and abolitionists, that spirit sung by immigrants and homesteaders and those who march for justice. The crowd erupted again. They applauded all the history with all the emotion of the moment. They cheered, nonstop, celebrating the past eight years as a talisman against the uncertainty of the upcoming four. Harmony Odunuyi, 9, from Chicago, wipes away tears after President Barack Obama’s farewell address January 10, 2017 at the McCormick Place in Chicago, Illinois.